12 | June | 2015 | Troy C. Wagstaff aka CallahanWriter Blog: Topics of interest include Western Historical (1865-1899) Topics. Additionally inspirational Christian and Fibromyalgia interests. A victim is, by definition, some who have had something happen to them that causes pain or destruction, against their will. But, what about applying the term to health issues? Is one a victim of some types of illnesses or diseases? If it happened again there will then the answer is yes. However, applying health issues to the term “victim” can be sticky because some would argue that health problems are a consequence of our actions. I agree with that. There are many avoidable diseases and illnesses. But there are many that, as of now, are not avoidable and thus serve to victimize the person who suffers from that illness or disease. Cancer is a disease that springs to mind when talking about victims of poor health. The invisible diseases like Chronic Fatigue, Chronic Pain and Fibromyalgia are also illnesses that come to mind, victimizing their hosts. I have had Fibromyalgia for more than thirty years. The last eleven years have included chronic bone crushing pain. The years before that included a lot of pain, but It came and went and was far from chronic and it was much easier to manage. I didn’t ask for it. I didn’t deliberately live a lifestyle to bring on the disease. No one knows for sure what causes fibroid, but some speculate that physical trauma or emotional trauma can trigger the disease. I’ve had five or six traumatic brain injuries and several broken bones to go along with the injuries that caused brain concussions. If that is the reason I currently suffer from chronic pain, then fine, but I never deliberately set out to get hit in the head with a flying baseball bat or get hit by a car while riding my bicycle etc. So what? Now we have established that those of us with invisible illnesses are victims of these illnesses that we didn’t ask for, what does that mean to me? How will that help me cope with fibromyalgia? No matter what pills the doctors give us, no matter what therapies work for us, we are never out of pain completely. There are always pain and malaise lurking somewhere in our bodies. Having a constant illness and pain wears us down physically and emotionally. The only known treatment for fibromyalgia is to treat the individual symptoms. That includes the symptoms of the mind or brain. Some of those symptoms can be as medical as anxiety and depression. Other symptoms can be feelings of guilt, lack of acceptance, hopelessness, helplessness, insecurities, anger, sadness, poor self esteem, lack of spirituality and increased frustration. If we can get on top of those symptoms it will help that part of the complex equation of fibromyalgia. These are feelings and issues common to people who have been victimized by whatever happened to them against their will. 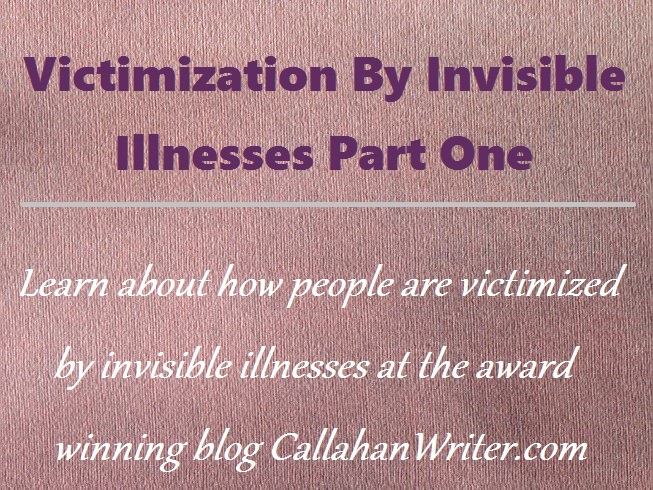 We will look into these topics on the upcoming posts called Victimization By Invisible Illnesses Parts two, three, four and maybe more. Make sure you are following this blog so you will get notified when these other posts are made. Or bookmark the blog and check back often. These additional posts will be made over the course of the next several weeks. 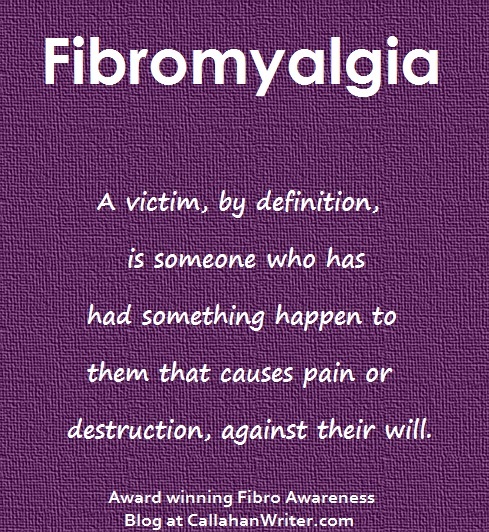 How do you feel about the idea of being victimized by fibromyalgia, chronic fatigue or other chronic pain illnesses? Have a story to tell? Let me know in the comments section. Make your voice heard. You may just be the right person to validate someone else who struggles.